Security door lock maintenance will increase your confidence as far as your home security is concerned and this won't only make you feel more certain about your property but will also keep intruders out of the door. Security door lock maintenance will increase your confidence as far as your home security is concerned and this won't only make you feel more certain about your property but will also keep intruders out of the door. The truth is that people are more inclined to repair existing problems than preventing them. After all, problems will pop up if the key is turned with force and breaks in the lock. Then again, this is one of the reasons why you must have the locks replaced before similar issues start occurring. In the meantime, ensuring the doors will lock and protect you from invasions should be your top priority and this is possible with maintenance. Adjust the strike plate at the door jamb. Find its exact position by pretending to close the door while pulling the latch out with the help of your key. When the latch seems to move directly into the hole of the strike plate, tighten its screws. Also check whether the screws are rusty and in this case, replace them. Lubricate the lock by inserting the stem of the lubricant's tube into the keyway and spray. Grime will come out. Have a cloth in hand to wipe it out and keep spraying till dirt has all come out. Tighten the hinges of the door and make sure it doesn't sag. Check the key. Make sure it is inserted perfectly in the lock (or at both sides of the door if you have a two sided lock). It must turn easily and be inserted without difficulty or the lock must be checked. Also check the key replacement. Check that the bolt is thrown out fully or the door won't lock properly. If it doesn't, lock repair is imperative. 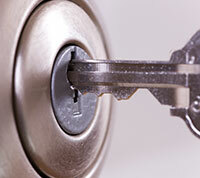 Clean the door locks by removing the dead bolt first. You should actually reach to the inner and outer cylinder in order to remove dirt and dust. You should also use a toothbrush or a similar small brush to remove debris from the pin holes.